When a client sends a recursive request to a name server, the server responds back with the answer if it has the information sought. If it doesn't, the server takes responsibility for finding the answer by becoming a client on behalf of the original client and sending new requests to other servers. The original client only sends one request, and eventually gets the information it wants (or an error message if it is not available). This technique is shown in Figure 244. This is the same theoretical DNS resolution that I showed in Figure 243, but this time, the client asks for the name servers to perform recursive resolution and they agree to do so. 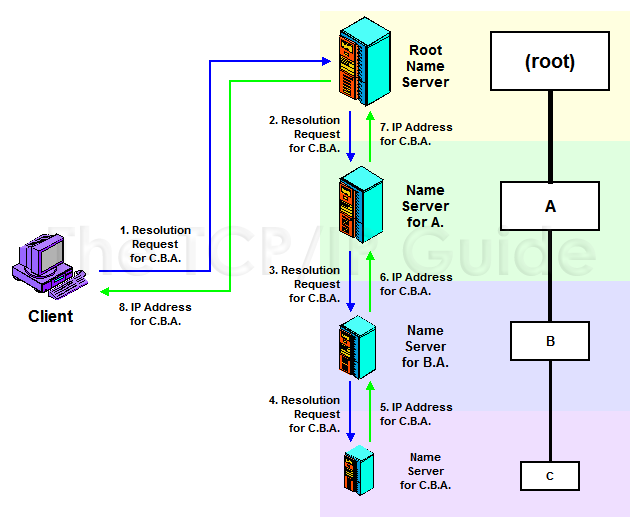 As in the iterative case, the client sends its initial request to the root name server. That server doesnt have the address of C.B.A., but instead of merely returning to the client the address of the name server for A., it sends a request to that server itself. That name server sends a request to the server for B.A., which in turn sends a request to the server for C.B.A.. The address of C.B.A. is then carried back up the chain of requests, from the server of C.B.A. to that of B.A., then A., then the root, and then finally, back to the client.